It’s hard to explain why we adopted our boys. We felt God’s call to do it, but I don’t think we even understood it ourselves. We were adopting, but what we were actually doing was watching two boys miraculously transform before our very eyes, learning about who were are as a family, and seeing more of who God is. Seven years later, we still don’t have the whole picture, but we are starting to get some glimpses. We are becoming convinced that we are treading on holy ground. This video, (<–click here!) about two special needs Russian orphans who were reunited by the New York Yankees this summer, is amazing. When these former crib mates were reunited, my heart saw a little glimpse of what heaven will be like. You can watch in the video how these boys were chosen, transformed, and honored. They had a fantastic time with the Yankees in New York. They met the baseball players, and had a wonderful trip. They could have never imagined such a thing when they were starving, and imprisoned in their crib. Yet the amazing happened. Because God moved His people to work in those boys’ lives, their families, other orphans, the Yankees– were all blessed. What if those families hadn’t chosen to adopt? What if we didn’t adopt our boys? Joshua would not have survived much longer without intervention; and Caleb would be in a residential treatment facility, according to his former case worker. Suicide, lives of crime, prostitution, starvation, and early death awaits the orphan in most cases, both here and abroad. Less than one percent of American foster children go on to finish college. There aren’t any uplifting videos to link for you on that topic. But in this case, parents did come for those boys. 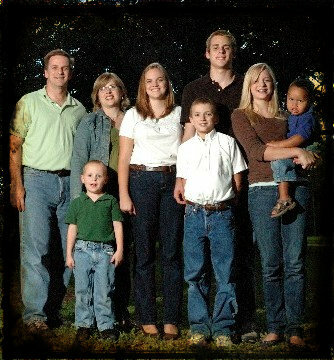 The adoptions (and the special needs) illustrate what God promises to you, personally. We are fallen people, and we have problems, until God comes and chooses us and frees us through His Son Jesus. Christians have a loving Father who cares for us, who teaches us to love and to trust, and enables us to walk. We fall down, we limp, we take wrong turns, but think of the difference in us since we’ve been chosen! The day will come when we will arrive in the eternal city. Believers will all have a moment when we are shown the city of God and are made new. Can you see yourself being given the tour? Oh how my heart yearns for that moment. That moment when Joshua will be healed of his fears and insecurities, and when his crumbling, nutrient deprived teeth will be solid. Caleb will get up and he will run unencumbered into the arms of the one who was his Great Physician all along. With two strong arms he will embrace his God. All of my children, they will be together, and whole. And then we will know why we adopted. It will be better than we ever imagined. Sue Barber is a blogger and the mother of six children. She has never sky dived, run for office, or been unloved. She writes at www.suebarber.wordpress.com. This post was written by Missy Leventhal – wife of HFO Ops guy David Leventhal. Missy & David have four children and are in the process of adopting their second child from China (a three year old little boy). Missy recently reflected on what she’s learned through the waiting process. Missy does her blogging at www.theleventhals.com & her Twittering at @missyleventhal. I’ve had several people ask me recently how I’m doing with the wait. So far I think I’m doing pretty good. We’ve had enough to distract us with buying a new house and preparing to move, along with the normal hustle and bustle of keeping up with the other four, that I haven’t had much time to sit and think about the wait. Don’t get me wrong, I think about my boy often! I’ve just done a better job this time around not letting the wait control me. As we got to this point with Abigail’s adoption I was consumed by blogs and yahoo groups. I would check them multiple times throughout the day to see if any of the families ahead of us in the process had gotten word of travel approval. I would get caught up in this cyberworld and WASTE hours upon hours glued to my computer. Daily. Now, there’s nothing wrong with blogs or yahoo groups…I obviously have a blog and I still participate in a yahoo group. They are great outlets and great sources for support. However, when you are so consumed by them that you can’t even step away to play with the children already in your home, or when they stir up anxiety and anxiousness it’s just not good. Also, the first time around I feel I fantasized about Abigail quite a bit. What she’d be like, how she’d act, what we’d do together, how the other kids would play with her…it was dreamy! She was perfect! I fell in love with a picture and a perfect, made-up child. Now, there’s nothing wrong with being excited and anticipating how things are going to change. But at some point the expectations formed through this anticipation are going to meet up with reality and some adjustments are going to have to be made. For me the depths of my expectations did not help me with our transition, and it took me months to figure out that the disconnection I was feeling with her was due, in a large part, to my unmet and unrealistic expectations. As I’ve come to understand my own heart more through much prayer, educated myself with some great books like The Connected Child, and surrounded myself with other godly adoptive families through our church’s adoption ministry (Watermark Tapestry), I’ve learned that I must evaluate and adjust my expectations so that they are more realistic. I must love my daughter for who she is and for how our God has created her, rather than try to make her into something she’s not. This is not a new concept to me, but it is one that took me being very intentional to really change my heart. So, I guess you can say, I learned my lesson the first time around! I do get excited about meeting Joshua and discovering his personality. I can’t wait to have him home to love on him, play with him, and cuddle him. I can’t wait to see how his little life is going to impact the lives of our other children. But I’m trying to be more realistic and almost hold my emotions an arm’s length away so that I can fall in love with him, and not what I imagine to be him! Does that even make any sense? Do I like waiting? No. I’d have him home today if I could. But I know waiting is part of the process. I know that my Lord loves him even more than I do, and I know that He can take care of Chang Shun just fine without me. I know that He has invited me into this process and is giving me the privilege of being this little boy’s mommy for a time. I know that all of my kids are HIS before they are mine, and so I must hold them with an open hand and trust in His loving care…much easier said than done! But I’m working on it!